This entry was posted in Uncategorized and tagged 5 Keys, Art Wolfe, Coast, Experience, Five Keys, Jay Goodrich, Learning, Ocean, Olympic National Park, Olympic Peninsula, Photography, Second Beach, Washington, Workshop by nixonphoto. Bookmark the permalink. I think your first point about group size is relevant to every point that follows. For me, being one of 30 photogs at a workshop would make it hard to feel like anything other than a number. But that brings me to what I would guess is the biggest impediment for folks who would like to attend a workshop but do not. Art’s workshops are relatively affordable—especially considering that it is a workshop with Art Wolfe! Would I rather have Art reduce the number of participants to 10 and increase the price to $4,500? In my case, no. That’s not even an option considering meals, transportation, and accommodations are not included in the price of the workshop. The reality of photo workshops is that they tend to be targeted at folks with considerable disposable income. And why shouldn’t they be? I say good for them! I’m happy to see any photographer make a good living. But it does leave folks who receive a more modest income on the outside looking in. My ideal workshop would not look much different from yours but with one additional caveat: I’m interested in workshops with premium instructors and premium locations; I’m less interested in premium meals and accommodations. Give me modest accommodations, decent meals, and a lower price. 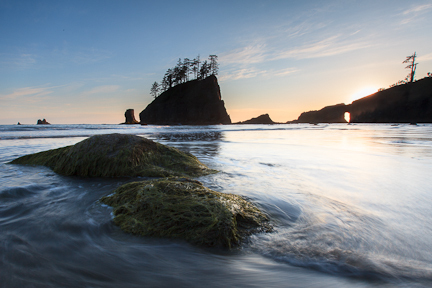 With Art’s Olympic Peninsula workshop, one is free to choose. This is not usually the case with out-of-country workshops. Having said that, if I’m a photographer offering a workshop and I can sell out with better amenities at a higher price, why wouldn’t I take that approach? I agree with the points. Your comment about workshops being targeted to people with considerable disposable income made me smile. The demographic for these workshops is generally the same – 40 and up, generally successful professionals, that have come to photography later in life. It’s so true. I’m trying to work out business models that would let photographers earn a living being photographers. Workshops kind of get you there, so I have no problems with that. While hanging out with a ‘big name’ photographer for a weekend or a week can be fun, the ideal is almost a rising star who is okay with 10 people in a workshop for a reasonable price and would still give you solid feedback on your images. I had a bullet point that started ‘Target Rich Environments’ – for me this is both a plus and I minus when I think about great locations. Typically great locations have iconic views and so there is a danger that everyone will come back with a variant of the same image, which is okay. What’s perhaps more interesting is pushing through that to come up with a unique interpretation. I find that taking that step can be tough to do in great locations without consciously thinking about it or being pushed to do so. Thanks for adding your voice to the conversation I appreciate it. To me it felt a bit like a cash grab. I was expecting 12-15 photographers. The moment that it was announced that, no, there were 30 I felt a bit cheated. Many years ago, Galen Rowell wrote an article about workshops and his claim that “Any photo class with more than 20 students is not a workshop, regardless how it is promoted” is really true. An effect of this large class size was that I was expecting to spend more time with Art, but with 29 other people (all with an equal claim to his time) I had to get in line. When the class was first advertised, the price was $1500 and $500/day seems to be pretty standard for guys like Art. Jack Dykinga gets that. So, the cost wasn’t due to economy of scale. It just struck me that the opportunity was there and they took it. It is a business, but it still left a bad taste in my mouth. I would have appreciated some advance notice that my perceptions would not match the reality. All of this said, I DO feel that it was a valuable experience. I came home with some different ideas for approaching a subject. I also came home with some post processing ideas that I hadn’t thought of before. Andy, We should set aside some time for “formulation chats”, don’t you think? We do indeed need to find some time to discuss approaches to ‘formulation’. Let me know when. I’m pretty free. Interesting how we are all different. The thought of “small groups” gives me the willies, as usually in a small group what you have are people wanting to dominate, “share their knowledge” or just “make friends” rather than learn what we are there to learn. I oh so much prefer the big group learning environment, lecture style. Do you think that there are some topics that work better in one setting over the other?